HALEIWA, Hawaii -- Alice Lunt didn't worry too much when she saw waves splashing close to her home on Oahu's North Shore on Christmas Eve. She had seen the ocean edge close before. But before dawn, a neighbor woke her with a call. "Everything was washing away," she remembered the neighbor saying.
} 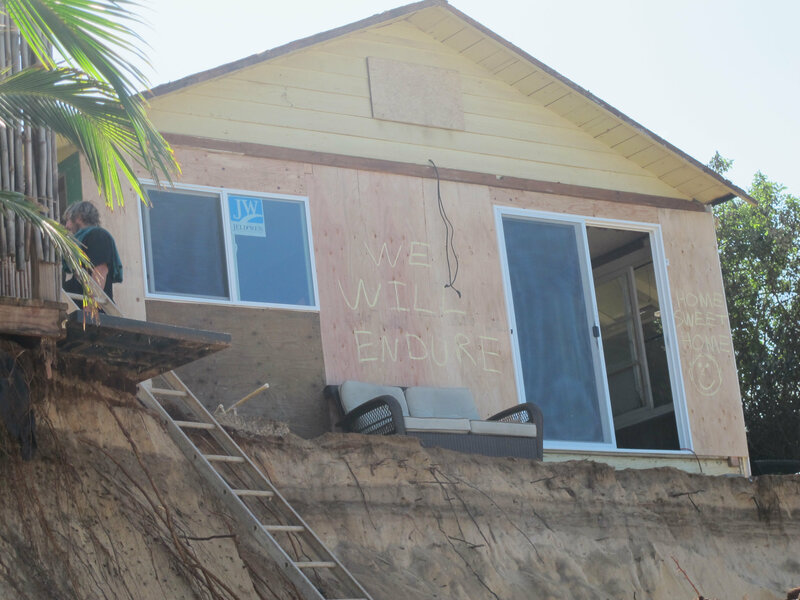 The water claimed Lunt's deck that day, and washed away a concrete slab the next night - part of a fast-moving collapse of the shore that also ripped out a neighbor's backyard and forced another to cut away rooms to save the rest of their house. The Christmas swell damaged at least five oceanfront properties in the neighborhood, rekindling a decades-old debate about how best the state and homeowners should respond to beach erosion and the increasingly rising waters of the Pacific Ocean. Some property owners want to be able to install a seawall or something similar to protect their property. Doing so, scientists say, could lead the sand on the nearby coastline - including Sunset Beach, home to some of the world's top surfing contests - to disappear. "Do you build a seawall and potentially condemn the beach to extinction in front of the seawall but at the same time buy a lot of time for homeowners on the nearby land to figure out how to move away from that situation?" asked Chip Fletcher, a University of Hawaii coastal geologist. "Or do you not build a seawall, condemning the homes and the developed land to extinction, but allow the beach to survive?" Fletcher said building seawalls always comes to mind wherever severe erosion occurs. He said studies show seawalls built on chronically eroding shorelines like Sunset Beach will only lead to more erosion down the coast. Fletcher noted that other Oahu communities have already lost large chunks of beach because of seawalls. These are stark options for Sunset Beach, where multimillion-dollar homes line the shore and where the globe's top surfers converge each year for the World Cup of Surfing. Property owners wanting to build a seawall would need to draft an environmental study and get a state permit, a process that could take months. In the short-term, they may receive emergency authorization to place sandbags and tarp in front of their properties to deflect the waves, said Sam Lemmo, the coastal lands office administrator. Krystle Dombrowski, whose family owns two houses next to Lunt's that they rent to vacationers, her husband, Kenneth, some friends and volunteers ran out of burlap sacks and had to buy all the pillowcases at Wal-Mart and made bright orange, red and polka dot sandbags. "We need something that's structurally sound, something that is really big, that can help us," she said. Large surf that regularly hits the North Shore each winter brought the Christmas swell, not a freak storm. Lunt said the beach fronting her home was particularly narrow because swells from the north that usually deposit sand during the summer weren't as frequent and westerly swells had taken away sand instead. West and northwest swells have continued to carry away sand this winter, she said. But more fundamental factors are also at play. One is that sea levels have been rising for years, pushing the ocean inland. Another is that the Sunset coastline is chronically eroding, just like 70 percent of the beaches on Oahu, Maui and Kauai islands. In the long term, both Lemmo and Fletcher believe government agencies should encourage people to move away from the coast to eliminate the question of whether seawalls should be built. "We need to accommodate the erosion, allow it to occur, and we need to move away from it so it doesn't affect our lives," Lemmo said. One option would be for a land conservation fund to buy properties along key shorelines and turn these areas into public parks, Fletcher said. In Hawaii, the counties decide how far back from the coast dwellings may be built. On Oahu, people may only build homes 40 feet from the shoreline. Kauai and Maui counties, however, have adopted tighter rules in recognition of the erosion creeping up on their coastlines. But even this may not be far enough, Fletcher said, noting these setbacks still allow buildings right on the sand dunes. Construction may need to be 150 feet from the shoreline to get away from the dunes, he said. Rocky Point homes, like many of Hawaii's coastal homes, were built on dunes that would now be feeding the beach with sand if they didn't have structures on them. The two-mile stretch of coastline from Sunset Point to Pupukea Beach Park was subdivided in the 1920s, according to "Beaches of Oahu" by John R. K. Clark. That was a time when scientists didn't know as much about sand dunes. The outlines of dunes are still visible in the rise and fall of pavement on the narrow road next to Lunt's home. Erosion like this will likely recur, Fletcher said, as sea levels rise and as climate change causes sea levels to rise even faster. This is especially true, he said, in places where sand dunes have been landscaped out of existence or are locked up by development. "The event on the North Shore is a warning for all of us in Hawaii that these sorts of occurrences are part of our future," he said.